Every young Saudi prince knows the story. The source of their family’s oil wealth starts back during the 1930s, when a small group of wildcatters drilled the Dammam No. 1 well. It was the first oil well ever drilled in Saudi Arabia. And it turned out to be a dud. So was the next. And the next. And the next. For these early drillers, the seventh time was the charm. On December 7, 1936, the Dammam No. 7 was spudded. More than two years passed before drillers struck oil on March 3, 1938. Unfortunately, all good things must eventually come to an end, and Saudi Arabia’s dominance over the world’s oil supply is no exception. More than 80 years have passed since oil was discovered in the Saudi Kingdom. But the situation may be worse than you might think. After Saudi Aramco’s financials were released to the public for the first time since the company was nationalized, several things quickly became apparent. The biggest revelation is that the world’s most profitable company has lifted the wall of secrecy regarding its oil fields. Buried in the prospectus was the fact that the mighty Ghawar oil field only held a production capacity around 4 million barrels per day — more than a million barrels lower than most believed. To put a little perspective on that, just consider that the Permian region will produce nearly 4.2 million barrels of oil per day this month. That thought alone strikes fear into the heart of each of those young princes. Well, at least it was a good run. The second wave of the U.S. shale revolution is coming. This will shake up international oil and gas trade flows, with profound implications for the geopolitics of energy. So just how optimistic is the IEA over U.S. oil production? 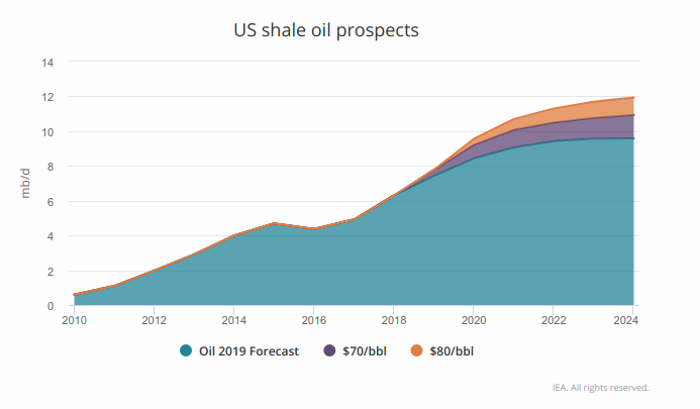 In its latest 2019 oil report, the IEA estimates that the United States will account for 70% of the total increase in global production capacity between now and 2024. Moreover, output from U.S. shale companies will rise to nearly 10 million barrels per day in the next five years. Yet there’s something peculiar to Birol’s bullish statement: It’s not the first time he said it! One year ago, he gave an interview to Bloomberg in which he said a second major wave of U.S. shale production was coming. But are we really that surprised to see our shale output reach those levels? What would it take to reach this new IEA prediction? In 2018, tight oil production in the United States reached a record 6.5 million barrels per day. That, dear reader, will inevitably lead to a surge in U.S. oil exports. Within five years, the IEA believes the U.S. will overtake Russia to become the world’s second-largest oil exporter. Are we looking at a case of wishful thinking? Remember, it took less than 10 years for the U.S. to go from an oil producer on the brink of collapse to one of the world’s largest oil exporters. Thing is, most people don’t realize another technological breakthrough is taking place as you read this. In fact, the company has already proven it’s far more efficient than today’s current techniques, and it’s only a matter of time before it spreads across the entire drilling sector. And my readers are going to ride this new fracking wave as it is unleashed on one prolific oil play that holds more than 46 billion barrels of undiscovered, technically recoverable crude oil. Oil has some great momentum behind it right now. The price of WTI crude topped $60 on Friday, ending its best first quarter in a decade. Next stop: $100... right?